There was a time, back when men were men* and photojournalists used film that transmitting on deadline was a major production. Back in the day, I used to travel with a footlocker of gear that contained an entire traditional wet darkroom, from film processing reels and tanks to an enlarger, and an AP transmitter, which was about the size of a portable typewriter and took 24 minutes to send one color photo over landlines. Now a traveling photojournalist works off of a MacBook Pro and wifi (or a cellular aircard) and you transmit from where ever you are. But there are times when even working off of a MacBook Pro and looking for wifi can be too time consuming. Hello iPhone. The iPhone 4 was my first iPhone. Before the iPhone I had a Palm Treo 680, slick when it was new, way back in 2006, but starting to show its age now. The iPhone has quickly become an indispensable tool in my digital toolbox. At first it just replaced my Treo - I used it for checking email, surfing the web and making phone calls. Now it’s way more than that. In July, at the height of the SB 1070 issue in the federal courts, I had to transmit photos of the ongoing protests from the sidewalk in front of the courthouse to the Arizona Republic. Working off my MacBook Pro wasn’t practical (too big to carry around, no where to sit and work etc) so I used the 5 megapixel camera in the iPhone to make photos and emailed them back to the office. The camera in the phone is great. For a cell phone camera. But it doesn’t equal even a point and shoot let alone a high end SLR. And there was no way to caption photos so editors on the receiving end had to cut and paste my caption from the email into the photo in Photoshop and then transfer the photo to the newspaper’s archive. The iPhone, while a good solution, was not a perfect solution. All of that has changed in just the last two weeks. 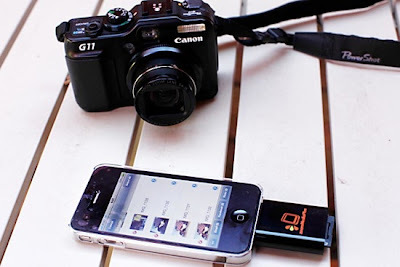 Now there’s a Secure Digital (SD) card reader for the phone and a terrific iPhone/iPad app called Filterstorm that allows me to use any camera that uses SD cards (in my case the Canon G11) access the JPEGs, caption them and ftp them to the Republic’s archive. Way cool. Filterstorm is an amazing app. At $3.99 it should be on every photographer’s iPhone or iPad. It’s gets regular updates and the support is superb. It has all the editing tools for editing photos you would expect, brightness and contrast control, sharpness and blurring and even curves. But what really sets it apart is the IPTC information and the ftp client. It does things some of the major players in software for photojournalists said couldn’t be done with the iPhone or iPad. Now my workflow on breaking, “we need it NOW!” stories is to make the photo with my Canon G11 pull out my iPhone attach the card reader and edit on the spot. I select the photos I want to send using the zoomit app, and copy them into my iPhone’s Photos app (I never actually launch the Photos app). When the photos I want to send, usually just two or three, are copied over, I exit out of zoomit and launch Filterstorm. I select the first photo; crop, color correct, tone and sharpen it, add a caption and then ftp the photo straight out of Filterstorm. When the first photo is done, I start on the second and so on. If I am covering a march or protest this allows me to keep up with the protesters where I would have fallen far behind if I had stopped to use a computer. The photo quality from the G11 is so much better than the iPhone that photos made with the G11 can go into the paper or on the web. Although some of my iPhone photos have been printed on paper, they were generally reserved for internet use. If I had a SLR that used SD cards, like the Canon 1D series, I could run photos from that camera through the phone (this could be a real boon to sports photographers who use the 1D series cameras). Working this way isn’t perfect. You can only work on one photo at a time with Filterstorm and you have to work with JPEGs - neither the iPhone nor the iPad have the oomph to convert raw files. Accurately typing names and captions on the iPhone’s touch screen is a challenge (and that’s being charitable). Finally, color correcting photos on a cell phone screen, even one as great as the iPhone’s, is really difficult. It would be easy to dismiss this solution as too little to be really useful. But I prefer to see it as just about perfect. It would be great to open multiple photos at once and set up a queue for transmitting, like I can on my MacBook Pro. But the phone’s not a MacBook Pro it doesn’t have the processor or RAM to deal with four or five 10 megapixel files (even JPEGs) at the same time. For what it does and what I need it’s darn near ideal. No offense intended. I mean “when men were men” in a gender neutral way.